Saga #49, by Brian K Vaughan and Fiona Staples, begins a new story arc for the band of fugitives caught up in a galaxy of war and, just from this beginning chapter alone, it looks to be one for the ages. The issue begins with Ianthe and her captive, The Will, piecing together the trail that Marko, Alana, and the rest are taking. The Will finds out Ianthe’s rather surprising reason for keeping him alive this long. Meanwhile, on the rocketship, things are as close to the normal as they get for Marko, Alana, Hazel, and their friends. Sir Robot IV is falling in love with Petrichor, who is quite reticent to love one of his people. Reporters Doff and Upsher, recently rescued by the group, offer Marko, Alana, and Hazel the chance to tell their story and get entirely new bodies, but they refuse for their own reasons. Hazel and Robot IV’s son, Squire, get into a fight and Hazel learns that words can hurt as much as violence. Finally, Robot IV reveals a secret he found out in a brothel about what really happened on Phang to Doff and Upsher. 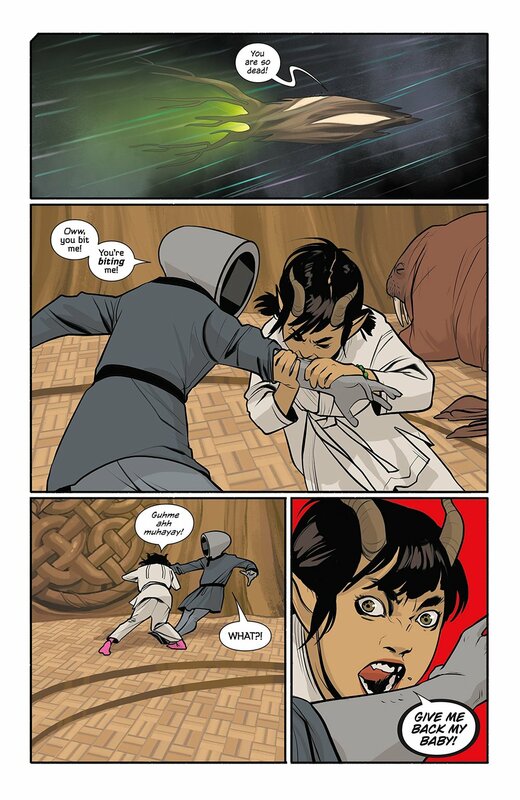 Recent arcs of Saga, while still very good, have felt like there was something missing. The character work and art were still as top shelf as they’ve always been and there were still those moments that evoked strong emotional responses, but the stories didn’t have that sense of narrative danger that they had in the past. In the early arcs, it felt like anything could happen and it often did. Vaughn and Staples weren’t afraid of pulling the ground out from under readers. As time went on, things started to feel a little safer as the book reached a comfortable equilibrium. It was still Saga, still one of the best books to come out every month, but something was missing. Well, this arc looks to be changing all that. The reveal at the end, with Robot IV telling Doff and Upsher what actually destroyed Phang is such a simple thing, yet its discovery has the potential to send the whole galaxy into turmoil. It’s a game changer. It has the potential to bring out the hunters again, making the cast’s life fraught with the kind of danger that has been missing for while. One of the strengths of early Saga was the highly emotional storytelling and the sense of the chase, that at any time, enemies could fall upon the family and destroy it. This arc has the potential to bring that back and it’s a welcome change. Saga works best when you have that feeling that anything could happen. Other than that big development, Saga still brings the characterization and emotion that it always has. Robot IV and Petrichor’s relationship was unexpected and for it to have such an effect on Robot IV is definitely a strange development. Robot IV, since his wife’s death, has been a hard, cynical character, and for him to have feelings for another is a huge character change. Petrichor’s reaction, however, is quite fitting and works well in the context of where this story could be going. Her supposition is that love is ephemeral in their situation, so they should just live for the moment. With danger approaching, that’s the perfect attitude to have. The tiff between Squire and Hazel is another little thing that Saga has been doing well since they’ve aged Hazel up, having her learn the lessons of childhood in warzones and other abnormal situations. The fight begins over a lost doll and is escalated to an extent that hurts Squire much more than any punch would have. It’s brutal in its simplicity, one of those childhood moments everyone has been a part of, when the right (or wrong) insult can cut to the quick. Doff and Upsher remain true to who they’ve always been, trying to advance their career without a thought for the peril it can put them or others in. Character work has always been the glue that held Saga and this issue has it in spades. Fiona Staples’ art is wonderful as usual. The expressiveness of her characters has always been strong and it really helps sell the moments in this particular issue. The only downside her art has, and always has had, is her backgrounds. There’s something extremely simple to them and it clashes with the detail she puts into the characters in foreground. Most of the time, the art in the foreground is so good, it’s hard to notice, so it’s a minor complaint. The last page stands out, as it reveals the crux of what’s to come. It’s a close-up of Robot IV’s monitor face and it’s rather simple, but the message flashing across the screen tells us all we need to know about what is going on in IV’s head. It’s perfect and another artist couldn’t pull it off with the power Staples does. All in all, Saga #49 is a return to form for a series that has went from amazing to “merely” great. It delivers everything readers have come to expect from Saga and brought back the sense of danger that drove the book for so long. Saga remains one of the top books Image puts out every month and, if this story arc is half as good as this issue, it will go down as one of the best stories in a book full of stellar ones.